Colour is a very personal preference. Any of you that know the musical 'Barnum' will remember Phineas T. Barnum's preference for rainbow colours and his wife Charity's love of the colours of the earth. I'm more like Barnum with a wardrobe full of reds, blues and orange, whereas Philip dresses in every shade of beige! People who have seen some of my gardens will also know that I love bright bold colours in my planting schemes. 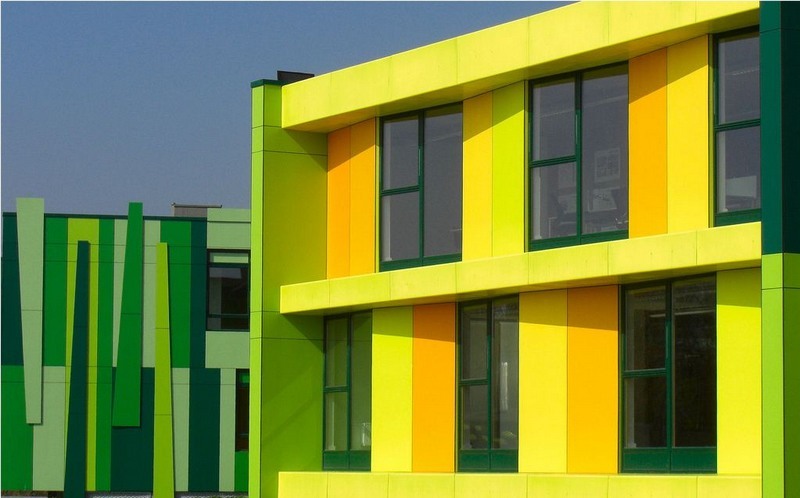 Well this blog is about none of that but about the use of colour in buildings. 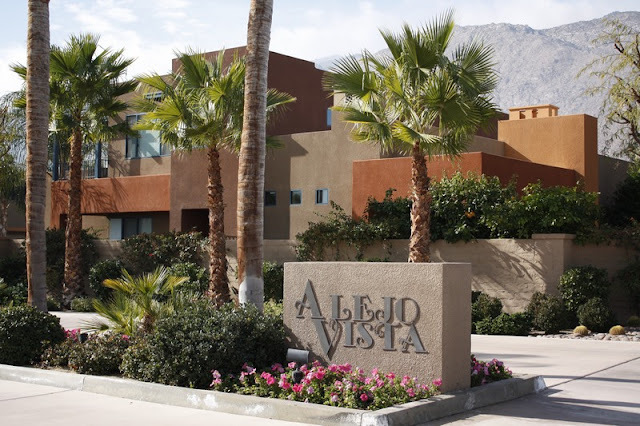 Here in Palm Springs there is an accepted palette of colour often used in buildings - stone colours, browns and terracotta. It works well with the palm trees and blue skies. A few years back we visited San Diego and I fell in love with a striking colour scheme of a small mall that we found by chance. Rather Disneyesque and I guess such colours will fall into the love or hate category but we liked it. 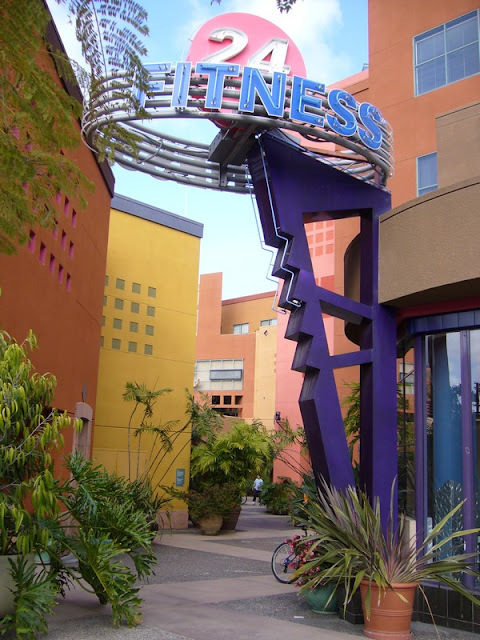 It reminds me of two strikingly coloured buildings back in Nottingham, UK. 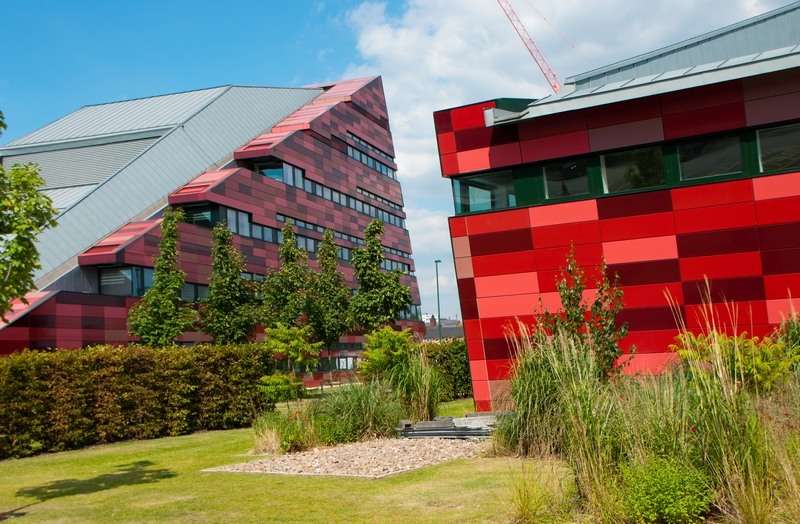 The second Phase of Jubilee Campus, part of the University of Nottingham included some dramatically shaped buildings clad in terracotta tiles in shades of red. it doesn't show much in this picture but the landscaping on this site was my last design project before I retired. the hedge in the picture was meant to be cut at an angle to mirror the building but it has never been done! One day I'll creep back with my shears! Opposite University Park is another strikingly coloured building although not owned by the University. Which brings me to the main point of this blog. 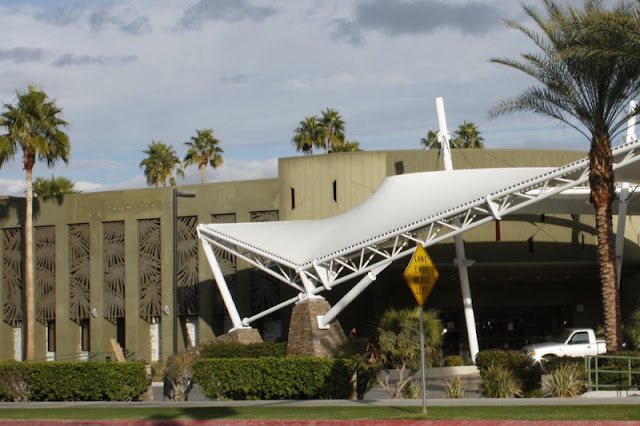 In Palm Springs there has been a Holiday Inn which has for years been clad in dirty green. Architecturally it is plain, although it includes some interesting metal panels depicting palm fronds but it's camouflage green gave it the look of wartime relic! It has recently changed hands and has become the Sagaura Hotel. 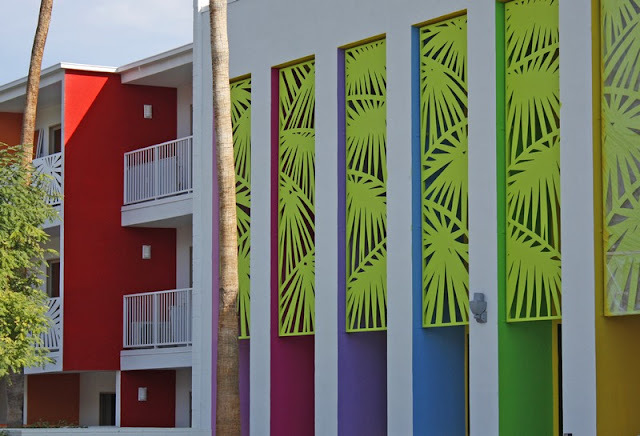 After much agonising, the local planners finally approved the new colour scheme for the hotel and this is the result although not totally completed. More pictures when its finished. We love it but I doubt it will be universally appreciated!